The repetition of words, selection of sounds, and careful choice of vocabulary, provide the greatest possible help in developing foundational skills. The repeated instruction to ‘say the sounds’ in the context of word reading provides practice in spoken English pronunciation and in syntax of increasing complexity. 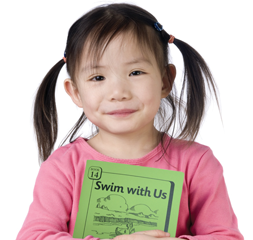 BRI begins with only five phonemes and three words, gradually introducing additional sounds and words as the student reads through the first set. Each new sound is taught before the student is asked to read the book and there is frequent repetition of both new and old sounds in successive stories to ensure that information is embedded. The stories are lively and engaging, helping students to read with expression and to understand what they are reading. ‘Story Summaries’ and ‘Story Questions’ in each book provide ample material for further development of comprehension and language skills. Students gradually learn to read new words by mastering the skills of decoding and blending the text. To ensure that they ‘read through the word’, and to eliminate guessing and memorising, many of the words used in the text are chosen because they look similar (e.g. sheet/shut/shell/shall/sell). SPELLING Workbooks are particularly helpful for augmenting learning for second language students (See Buy books). Reading support for children learning English as a second language.